The first post about Sylvia Plath archives in this, American Archives Month, is one that I began writing in March, 2010. Shocking! 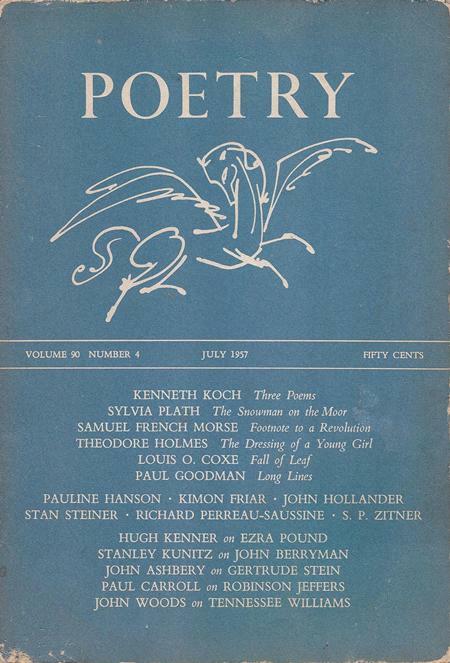 The archives of Poetry: A Magazine of Verse, from 1912-1961, are held in the Special Collections Research Center at the University of Chicago and contains documents originated by Sylvia Plath. The collection includes typescripts by Plath, marked up with editorial instructions; correspondence; and proofs, many with autograph annotations by Plath. 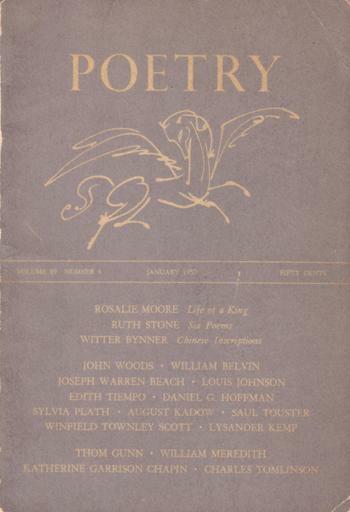 "Wreath for a Bridal", "Dream with Clam-Digger", "Strumpet Song", "Metamorphosis" (later titled "Faun"), "Two Sisters of Persephone", and "Epitaph for Fire and Flower" from Poetry 89 (January 1957: 231-237). "The Snowman on the Moor", "Sow", "Ella Mason and Her Eleven Cats", and "On the Difficulty of Conjuring up a Dryad" from Poetry 90 (July 1957: 229-236). 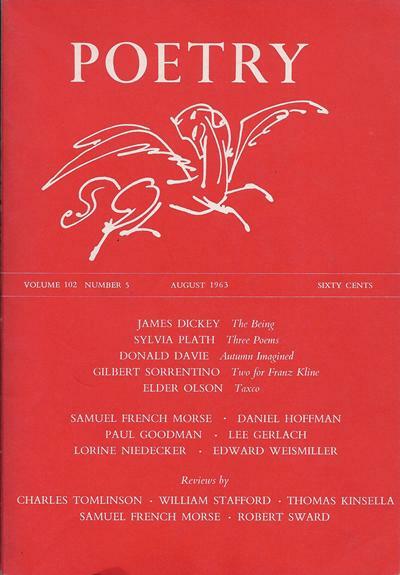 "On the Decline of Oracles", "The Death of Myth-Making", and "A Lesson in Vengeance" from Poetry 94 (September 1959: 368-371). The correspondence is between Plath and editors Karl Shapiro and Henry Rago. Also included are a couple of letters about Plath. In the letters held in the archive for the period between 1956 and 1961, Poetry apparently rejected only one submission from Plath, and that was "Poem for a Birthday". The letters to Shapiro and Rago are cordial and professional in tone and nature. On 17 April 1956, Plath sent a batch of poems for his consideration, mentioning that her poems have previously appeared in The Atlantic, Harper's, The Nation, Mademoiselle, and the New Orleans Poetry Journal. There are two letters to Henry Rago. On 25 June 1958, Plath writes to Rago submitting a group of new poems written after a year spent largely teaching and not writing. Another letter is addressed to the Copyright Department of Poetry and is dated 7 October 1961. In this letter she is asking, for Knopf, for copyright assignment to Plath for several poems that were to appear in Knopf's 1962 edition of The Colossus. The poems were "Metamorphosis" (since renamed "Faun"), "Sow", and "Strumpet Song". Additionally, poets.org has an article "From the Archive: Sylvia Plath". At the bottom is a lovely slideshow of images of Plath related documents. No one I have written to at the Foundation seems to know where the original documents for slides 6-9 are. They were not among the photocopies I received of the Plath documents held in the papers at University of Chicago. The Lilly Library holds Poetry's records from 1954-2002. There is some overlap, in terms of years, with what is held at Chicago, but based on a search of the papers conducted by the ace staff at the Lilly, there is no Plath "stuff" in the collection. All links accessed 25 September 2013. How interesting Peter... a mystery - why would they have wanted the text blacked out? Such intrigue! Be sure to post more if you find anything out! Great post by the way, it is always lovely to hear about archives.